DOHA, Qatar, 2017-Aug-21 — /Travel PR News/ — Qatar Airways has announced it will launch flights to beautiful Chiang Mai, its fourth destination in Thailand, as it expands to meet increased demand for Thai destinations from holiday-makers. The new route comes in addition to existing services to the Thai capital Bangkok, and to the top holiday destinations of Phuket and Krabi. The new four-times weekly seasonal service will operate between Doha and Chiang Mai (CNX), using a wide-body aircraft, from December 2017 until May 2018. 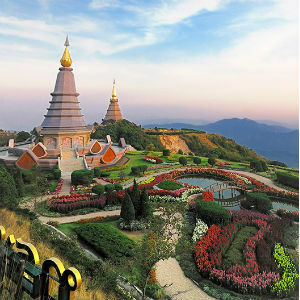 Laid-back Chiang Mai offers a retreat from the hustle and bustle of Bangkok, and has been called the ‘Rose of the North’ in recognition of its calm vibe and lush setting. Nestled amid surrounding rainforest, Chiang Mai offers visitors an amazing authentic Thai experience, with scores of stunning temples, fabulous restaurants and incredible natural scenery. Qatar Airways Group Chief Executive, His Excellency Mr. Akbar Al Baker, said: “Thailand continues to grow in popularity with holiday-makers and it’s not hard to see why. Our new flights to Chiang Mai mark our fourth route to this beautiful country, reflecting the demand from our customers for more high-quality leisure destinations. Qatar Airways first started flying to Thailand in 1996 with a service to Bangkok. Flights then followed to Phuket and Krabi. The airline currently offers five daily flights from Doha to Bangkok, as well as a double-daily service from Doha to Phuket and three flights a week from Doha to Krabi. Later this year, Krabi will become a daily service, which means the total number of flights each week to Thailand will rise to 60. The start of this new seasonal service is the latest in a series of ambitious recent route launches announced by Qatar Airways, including Prague, Czech Republic; Kyiv, Ukraine and Sarajevo, Bosnia and Herzegovina. The 2017 Airline of the Year, as awarded by Skytrax, has a host of exciting new destinations planned for the remainder of this year and 2018, including Canberra, Australia; Rio de Janeiro, Brazil; San Francisco, U.S.; and Santiago, Chile, to name just a few. Qatar Airways has received a number of major accolades this year, including Airline of the Year by the prestigious 2017 Skytrax World Airline Awards, which was held at the Paris Air Show. This is the fourth time that Qatar Airways has been given this global recognition as the world’s best airline. As well as being voted Best Airline by travellers from around the world, Qatar’s national flag carrier also won a raft of other major awards at the ceremony, including Best Airline in the Middle East, World’s Best Business Class and World’s Best First Class Airline Lounge. This entry was posted in Airlines, Airports, Business, Flights, Travel, Travel Management, Travel Services, Travelers and tagged Akbar Al Baker, Chiang Mai, flights, Qatar Airways, thailand. Bookmark the permalink.